The 2019 Budget Rating Simulator is available for downloading. This is not an update, but a completely new version of the simulator program updated for 2019. There are several important notes in using the Simulator to predict budget ratings for next year. 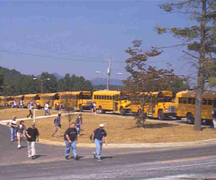 Update students transported from the September, 2018 student count, including those transported by contract transportation. Update the number of buses you will operate on regular routes for 91 days or more. Update Expenditures based on your estimates for 2018-2019. Enter the amount that you received for legislative increases this year (lines 10 and 12 on your 2018 transportation funding sheet). The amount is listed on the Operating Data tab when doing simulations and must be entered by the user. Fuel - You will need to enter the fuel cost differential. This is entered on the Operating Data tab when doing simulations. Fuel cost averaged $2.08 during 2017-2018. The current per gallon average cost for the school year was $2.26 as of this week. If the December 18th price of $1.92 were to hold through the school year, the differential in June would be nearly 0.